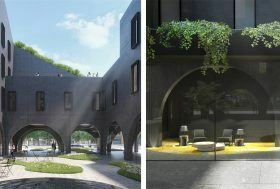 ODA Architects’ boutique hotel planned for the Brooklyn neighborhood of Crown Heights got fresh renderings this week, revealing more details about its archway-filled, concrete design. Developed by All Year Management, the Bedford Hotel is located at 1550 Bedford Avenue, right by the Prospect Park, Brooklyn Museum and the Botanic Gardens. As designboom learned, the 100-room hotel’s archway design stems from the classic Brooklyn architecture found elsewhere in the neighborhood, like the Soldiers’ and Sailors’ Arch at the Grand Army Plaza.